From the Philippines to China, reenacted crucifixions, mass baptisms and more reveal another side of Christianity on Easter. As with any religion that enjoys a global following, Christianity has taken on strong local characteristics around the world. The core of the faith revolves around the Bible and belief in the resurrection of Jesus Christ, but the customs, rituals and political standing of the church varies greatly in each country. Asia illustrates this point perhaps more dramatically than any region on earth. From Easter egg hunts in Palu (Indonesia’s Sulawesi province) and reenacted crucifixions in the Philippines to church closures in predominantly Muslim Indonesia and mass Catholic baptisms in China, a number of traditions, trends and troubling political realities reveal a church heavily in flux across Asia today. Perhaps the most dramatic and well known practices of all those unique to Asia take place in the Philippines. Since 1955, devout believers with a penchant for pain in the northern Philippines have acted out the gruesome annual rituals of whipping themselves and even being crucified (for a period of several minutes) on Good Friday, drawing on a syncretistic mix of Roman Catholic and folk beliefs. Last Friday, some 2,000 self-flagellants beat themselves with bamboo rods while walking along an imitation of the Stations of the Cross. 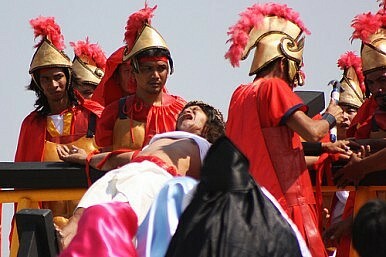 According to the Christian Post, at least 16 devotees were literally nailed to crosses in Pampanga province. Unnerving photos taken of the spectacle can be seen here. Philstar.com reported that last Friday in the northern Philippine village of San Pedro Cutud, 52-year-old house painter Ruben Enaje screamed into a wireless microphone as men dressed as Roman soldiers drove five-inch stainless steel nails into his hands and feet. It was the 27th time that Enaje has reenacted Christ’s crucifixion, which he was inspired to endure as a show of gratitude to God after surviving a fall from a building. The reenactment drew a crowd of thousands, and is believed to bring about forgiveness, cure illness or lead to wish fulfillment. The Catholic Church does not endorse these extreme practices, but acknowledged that it cannot stop them either. Delivering a more mainline Easter message to the Philippines’ faithful, recent papal contender and Manila Archbishop Luis Antonio Cardinal Tagle offered a message of hope, reminding Filipinos to allow God to bring “fresh life“ to them amid the trials of the world. “It is time to look to God, the giver of life,” he said. Meanwhile, in China it is not the church seeking to guide how believers worship, but the government making claims of authority over the church. China has around 12 million Catholics. Roughly half attend the Chinese Catholic Patriotic Association (Beijing), while the other half follows the Pope (Rome), resulting in a conflicted church with strongly divided loyalties. And the church is growing rapidly. Some 22,000 baptisms took place on Easter of last year alone. Al Jazeera reported that, according to the U.S.-based human rights group China Aid, the number of Christians in China has surged 100-fold since the People’s Republic of China was founded. In total, there are 80 million to 130 million active Christians in China, including members of so-called “house churches,” which operate beyond public view. It’s also worth noting that Catholic eyes are watching how Pope Francis handles Beijing. While China congratulated the new pope on his election last month, Beijing also warned him not to meddle in China’s domestic religious affairs, while calling on the Vatican to sever its ties with Taiwan.